The Queen, accompanied by The Duke of Edinburgh, traveled in State to the Palace of Westminster to open the Session of Parliament. The Prince of Wales and The Duchess of Cornwall were also in attendance. 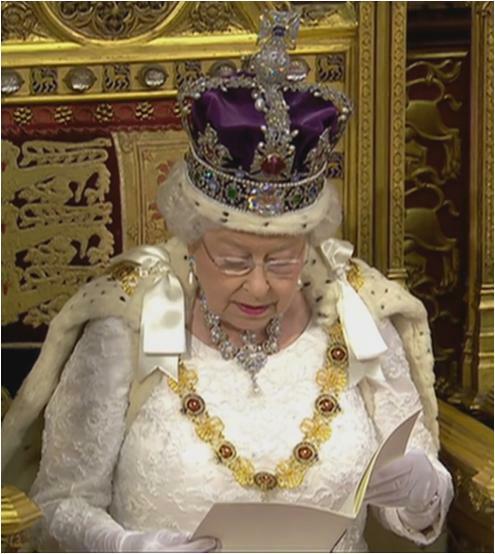 Queen Victoria's Golden Jubilee Necklace took a break from the State Opening last year (after appearing in 2013 and 2014), but it's back on top this year, accompanied by Queen Victoria's enormous pearl drop earrings. She concealed any present bracelet under her gloves, though an evening watch was spotted on one wrist. 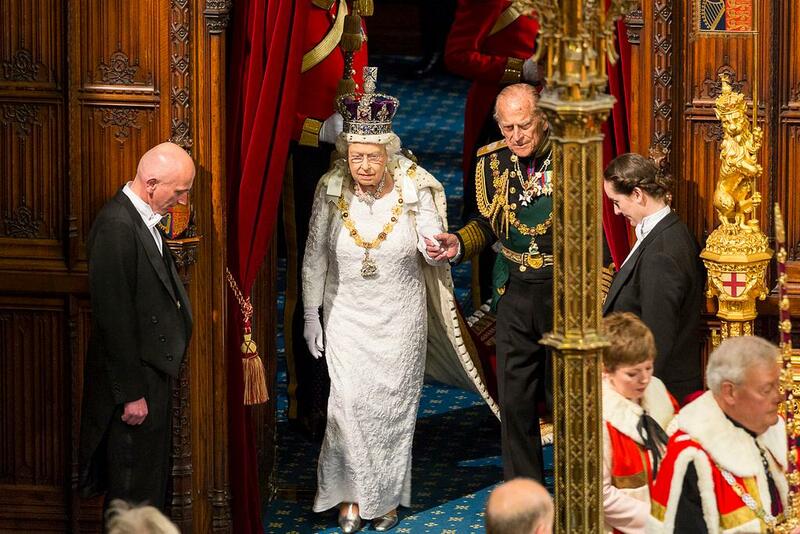 As always, the Collar and Great George of the Order of the Garter adorned Her Majesty's robe once inside Parliament. The Duke of Edinburgh wore the same, layered over the dark green Riband of the Order of the Thistle and the many other decorations adorning his uniform. 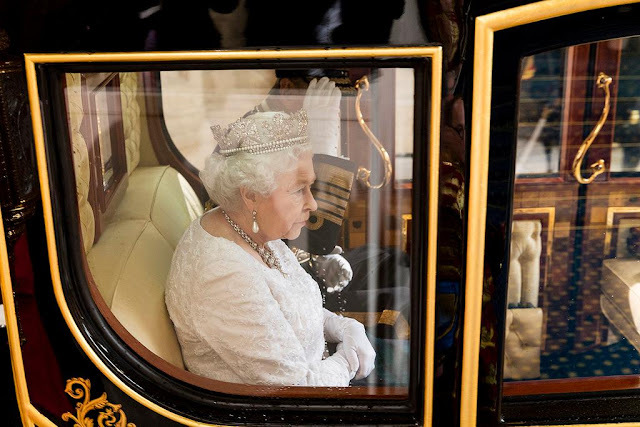 What was new this year for The Queen? She took the lift on arrival, avoiding the 26 stairs at the Sovereign's Entrance. Buckingham Palace said it was a "modest adjustment" for her comfort, but some are calling it the most public concession to her age yet. Well, she's not immortal (alas!). The Prince of Wales and The Duchess of Cornwall were once again in attendance; they've attended every year since 2013. 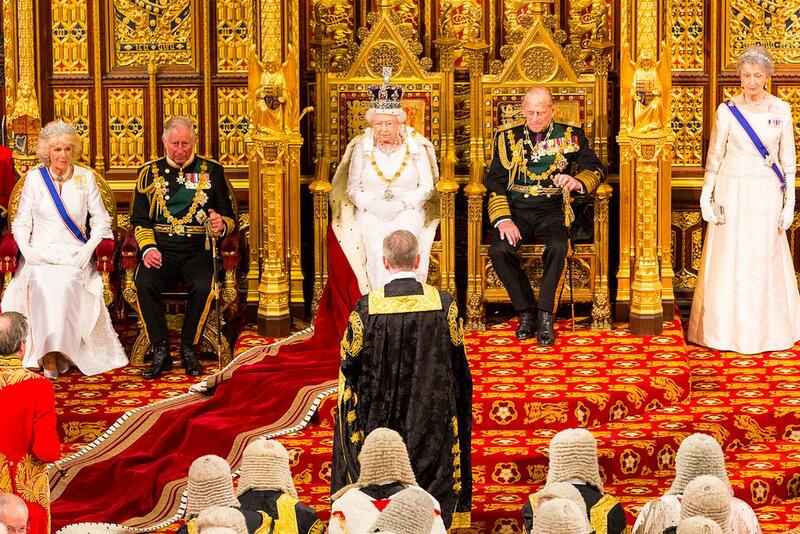 Charles wears the same set up as his father, with the Garter Collar over the Thistle sash, and plenty of other uniform decorations to boot. 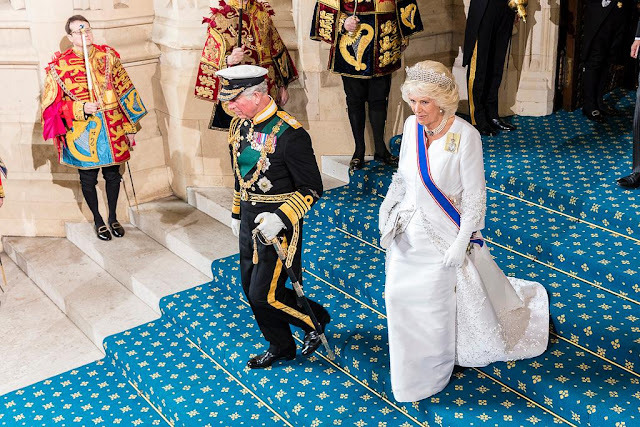 The Duchess of Cornwall repeated her look from last year's State Opening, right down to the details: same outfit, same jewels (see last year's post here). The outfit and the oblong brooch anchoring her sash were both new last year, but she's used this tiara/earring/choker combo every year since she started attending. I think this is both her trying to take a back seat to the proceedings, and just the most appropriate combination she has for a state event that is also a daytime event. Oh, but this dress does look good on the steps, does it not? This top coat/skirt thing is fabulous.